To prepare students for Rosh Hashanah, the Jewish new year, Rabbi Danielle Stillman thought about the bees. The four hives of pollinators on the Ursinus College organic farm had lessons to teach, about tradition and responsibility. "Honey is one of the symbols of the holiday, to wish for a sweet new year," said Stillman, adviser to the Montgomery County school's Hillel, a Jewish campus organization. But the plight of honeybees, a threatened population that pollinates fruits and vegetables, also offers lessons about the environment for the faithful in a religion that has a lot to say about stewardship of the earth, the rabbi said. So when the period known as the High Holy Days starts Wednesday evening with Rosh Hashanah, sustainability will be the theme on campus. Last week, a visit to the bees housed on the campus' organic farm helped prepare students for the new year. On Sept. 14, a walk around the school's labyrinth will close out the holiday period. Students will circle the brick path as a form of meditation on Yom Kippur, the Day of Atonement, reserved for reflection and taking stock. Josh Hoffman, a copresident of Hillel, plans to make a new year's resolution "to be better" to the environment. "In my head, I've made God and nature synonymous," said Hoffman, 20, of Wynnewood. "So I consider respecting nature a way of respecting God." The merger of sustainability themes with the High Holidays is one way Stillman hopes to make Judaism relevant in the everyday lives of students, Stillman said. That is a goal of Hillel, a Jewish college organization with headquarters on campuses across the region. "Judaism doesn't have to be sequestered into one little space," Stillman said. The faith tradition historically incorporates environmental issues partly because most Jewish holidays have some link to the agricultural cycle, Stillman said. Sukkoth, Passover, and Shavuot are holidays related to the pilgrimage of Jews and the harvest. Tu Bishvat is an environmental-awareness day known as New Year for the trees. The weekly observance of Shabbat instructs that Jews are not to shop, drive, or use electricity, said Judith Belasco, director of programs for Hazon, a Jewish nonprofit whose mission is to "create healthier and more sustainable communities." Last month, Hazon, which recently opened a Philadelphia branch, released a statement encouraging Jews to consider sustainability issues and the honeybees' predicament during the High Holy Days. Their survival is threatened by what is known as colony collapse disorder, a disappearance of their habitat because of factors including pesticides and insecticides, said Brandon Hoover, Ursinus' sustainability program coordinator. At Rosh Hashanah dinners, families traditionally dip slices of apples into honey and wish for a sweet new year. 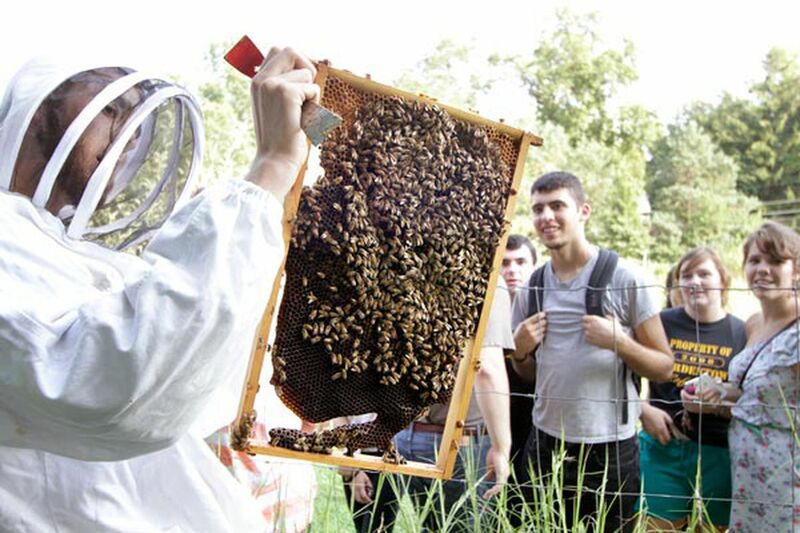 Last Wednesday, about 25 students - Jewish and non-Jewish - visited the campus' organic farm, for a Hillel-organized lesson on the bees. The hives are part of the 3-acre organic farm that grows produce including broccoli, apples, pears, corn, and raspberries. Swathed in a hood with netting and a jacket, student beekeeper Travis Maider pointed out the queen, talked about the "waggle dance" form of bee communication, and helped students don netting to get a closer look. "We don't take the honey. We let the bees be the bees," Maider said. Neomi Haut circled the hives to take photographs. "It was nice to experience this for Rosh Hashanah and see the honey that the bees were making," said Haut, a 19-year-old freshman who was born in Israel. During the holidays, Haut's family gathers for dinner and passes a bowl of apples. "Each person takes turns dipping the apple into the honey and says what they wish for in the new year," Haut said. That tradition will be repeated in homes starting Wednesday night when the year changes from 5773 to 5774 on the Jewish calendar. The world will be one year older, Stillman said, "so we are honoring the earth and thinking about what is our responsibility to take care of it." Contact Kristin E. Holmes at 610-313-8211 or kholmes@phillynews.com.